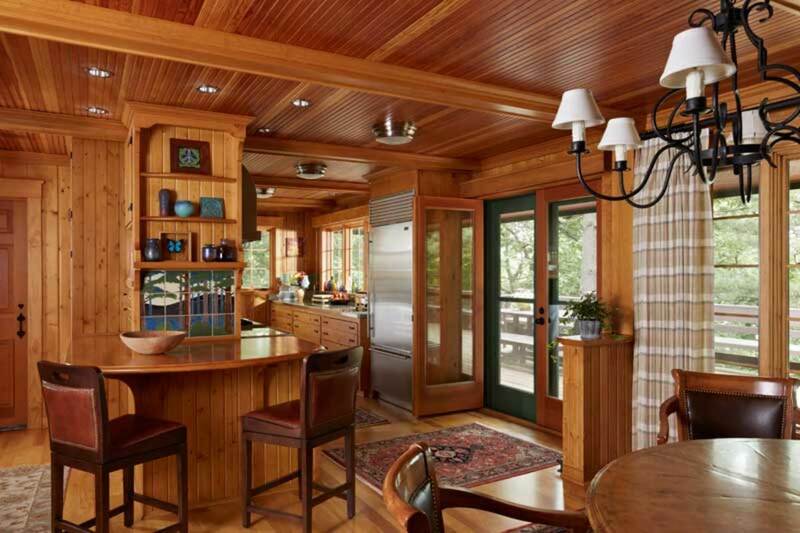 In this upgrade of a 1956 cabin, raising the roof created classic bungalow lines that envelop a well-crafted cottage interior. 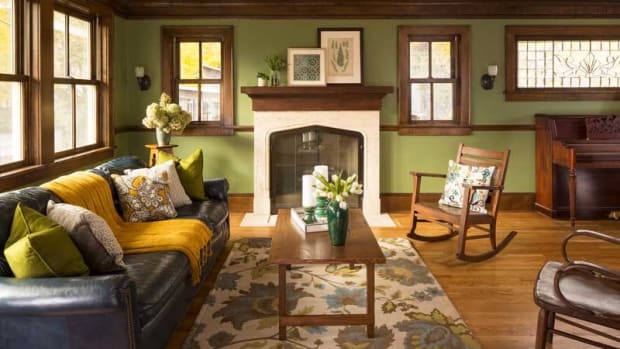 Wearing cedar shakes and old-fashioned green shutters, the quietly updated house nestles into this lovely setting. This complete makeover shows how the cottage sensibility can be preserved even when a vacation cabin becomes a year-round home, updated with modern amenities. Working within the strict guidelines of the Lower Saint Croix National Scenic Riverway, which are regulated by the federal government as well as local townships, David Heide Design Studio put a handsome new face on the house while retaining original features. The board-and-batten siding remains, enhanced now with shingles on the second level and a cedar-shake roof. Heide had to stay within the original footprint, and so raised the roof ridge three feet and added dormers to create a second floor. 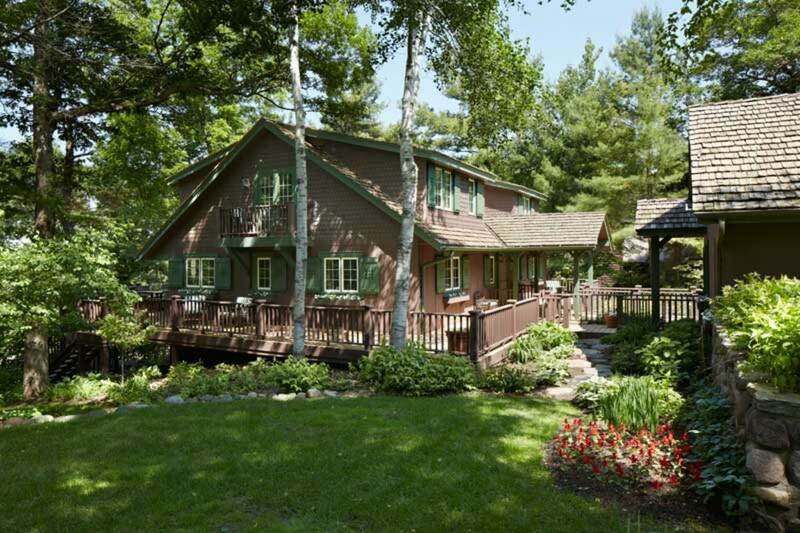 Now bungalow rooflines envelop the forest-color exterior with its whimsical cottage shutters. The steeper pitch allowed conversion of the children’s loft into a new master suite, a guest suite, and a laundry room. 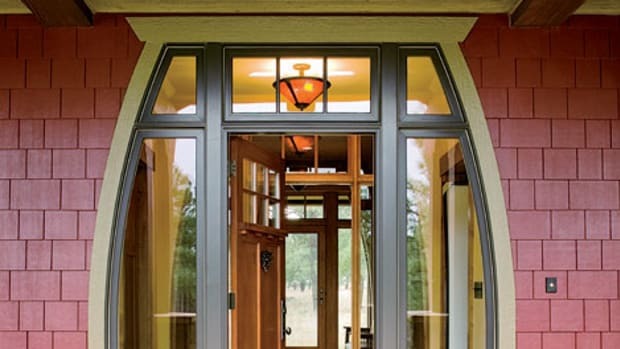 David Heide Design Studio redesigned this 1950s cabin to be a year-round home. “The Scenic Riverway guidelines go beyond setbacks,” David Heide explains. “They essentially demand that the houses be discreet, if not invisible, when viewed from the river. Materials and colors must reflect nature, height is restricted, as is clearing of vegetation…it was a challenge. “The house was a ’50s rambler,” Heide says, “mostly a Sheetrock box but with some cabin-like details, including knotty-pin paneling. 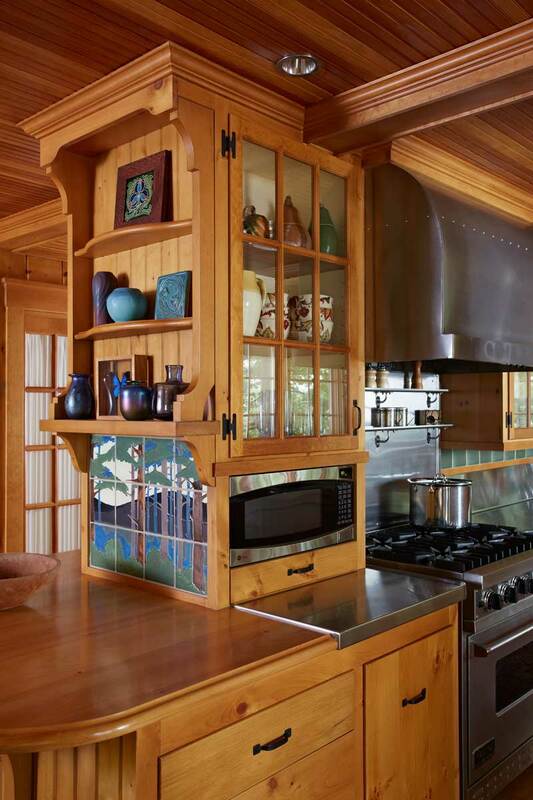 My clients had added some wood details over the years.” Doug and Ann McMillan bought the cabin in Hudson, Wisconsin, in the early 1990s, using it as a family summer getaway. But 20 years later they were spending more time at the place and decided to upgrade. The main-level kitchen remains in its original location, and retains the unique stainless-steel drawers and countertops installed by the first owner. The art tile mural is by Motawi. 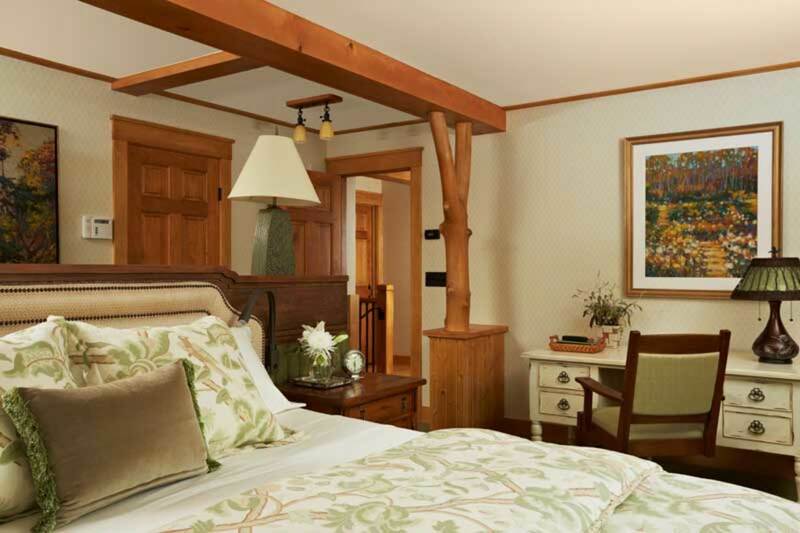 “Our original intention was to create a master bedroom with a bathroom that would work in cooler months,” Ann says. 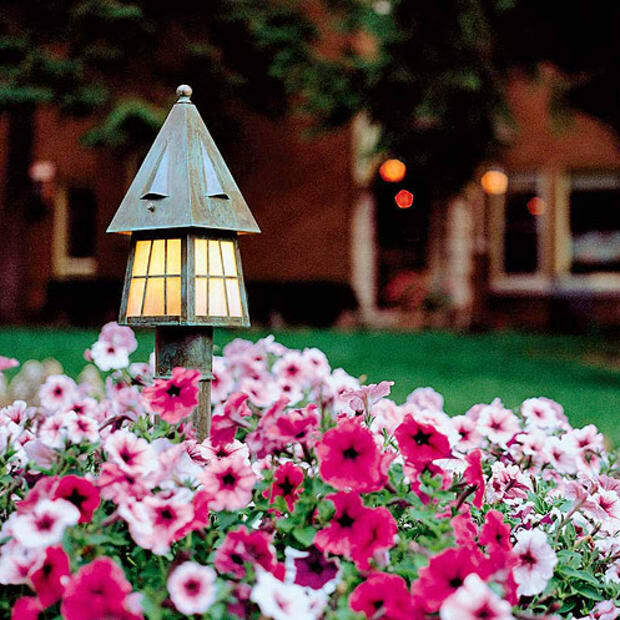 “But during the remodeling we missed a summer—the project was complete in September. So Doug and I moved in just to take advantage of the remaining good weather. We never returned to St. Paul!” The couple, in fact, sold their other house. The overflow kitchen on the lower level has shutters to close it off from the family room. Countertops are granite. 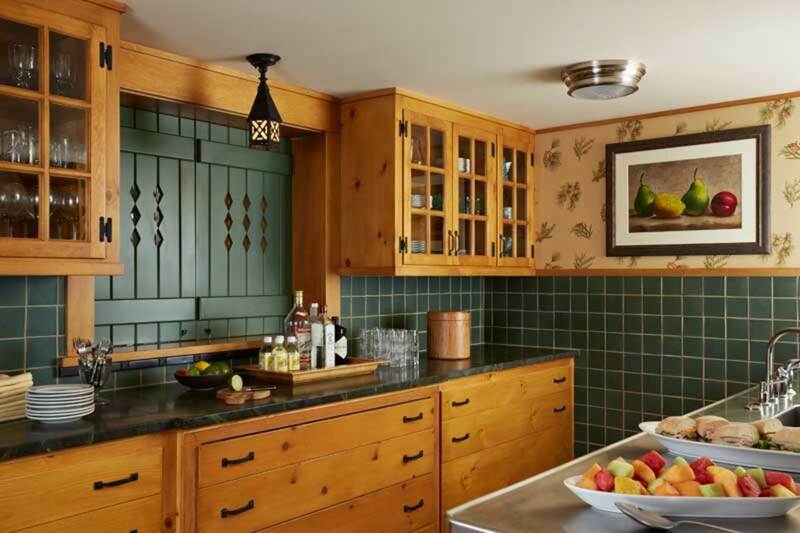 The overflow kitchen downstairs was reconfigured using original materials, then given cottage charm with forest-theme wallpaper and a pair of cutout shutters to separate it from the family room. 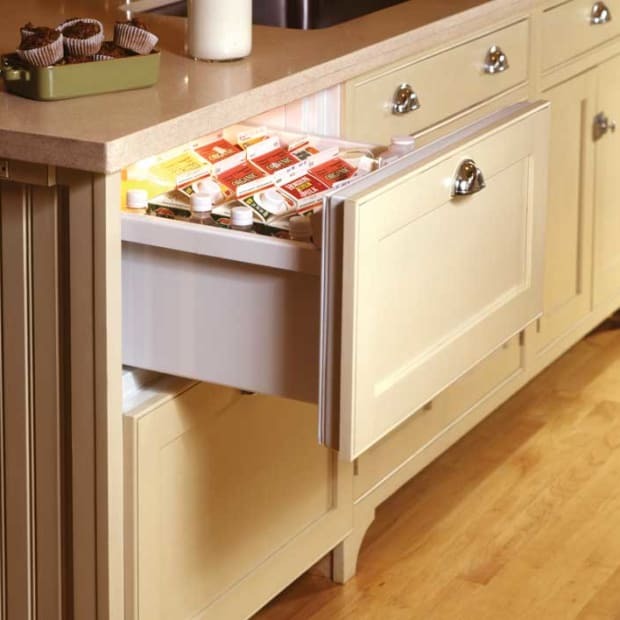 “It comes in handy,” Ann says, providing additional storage, ovens, and workspace for caterers during big family gatherings. The room is immediately accessible to an outdoor terrace and the path to the river. Square backsplash and wainscot tiles here are from North Prairie Tileworks; the paper is ‘Evergreen’ from Thibaut. Further dividing dressing and sleeping areas is a large fir beam supported on debarked tree trunks, echoing the stair detail in the house. Before, the house had an open loft, with two twin beds tucked into the space left between knee walls at the eaves. With the raised roof and four large, shed-roof dormers for headroom, the new second floor accommodates bedrooms and a laundry area. 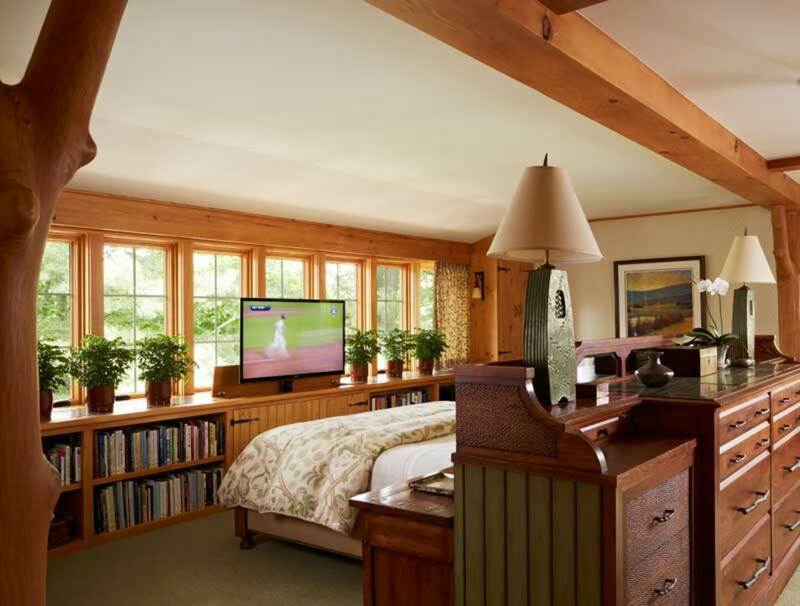 The master bedroom is long and narrow; Heide placed the bed closer to the windows and backed it with a custom dresser, dividing the room into sleeping and dressing spaces. The bed is backed by a floating dresser, designed by Heide’s studio, an interpretation of early 20th-century tramp art featuring chipped wood details and carving. The dresser was inspired by tramp art, a folk art practiced ca. 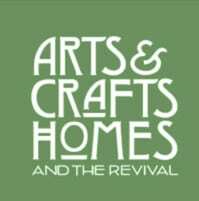 1870 to 1940 and given the whimsical name, appropriately enough, during the 1950s, by antiques dealers. 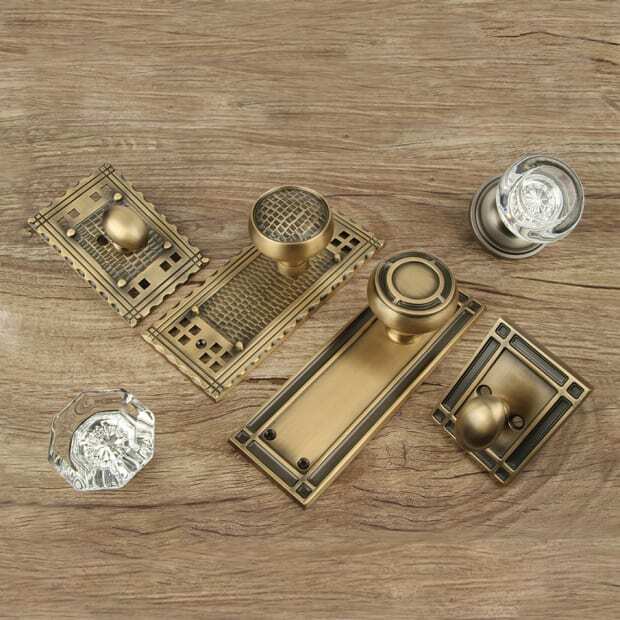 Like the old picture frames and decorative pieces, the dresser is chip-carved, and inlaid with mirrors and stone. Behind it, doors open to walk-in closets from a dressing area with a built-in bench seat. The room is further divided by a fir beam supported on tree trunks, a detail that also appears on the staircase. The spacious washroom leads to a separate shower and toilet. A cabin aesthetic, locally crafted, shows up in knotty-pine vanities and new skylights by Century Studios in St. Paul. This one is Spring; another one celebrates Autumn. Behind the dressing area, the master bath has a spacious lavatory with twin facing sink counters; a door opens to a separate shower and toilet. 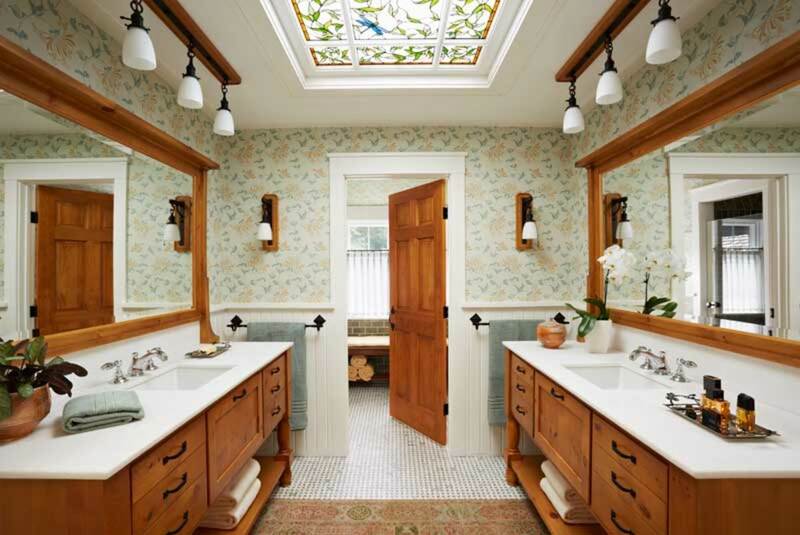 The knotty pine vanities by a local company, and new skylights with leaf motifs, celebrate the forest setting. (LED lights lining the skylights allow the glass pattern to be seen at night.) The Stark wallpaper is a contemporary interpretation of William Morris’s ‘Honeysuckle’ pattern. The marble tile floor was set in a traditional basket-weave pattern over radiant heat. The owners say they had a master plan created for the site during the 1990s, after a terrible storm took out many of the old white pines. “I have a degree in landscape architecture,” Ann confides, “and I’ve tried to maintain the original design, but I can’t resist the temptation to experiment with new plants and colors.” Wearing cedar shakes and old-fashioned green shutters, the quietly updated house nestles into this lovely setting. 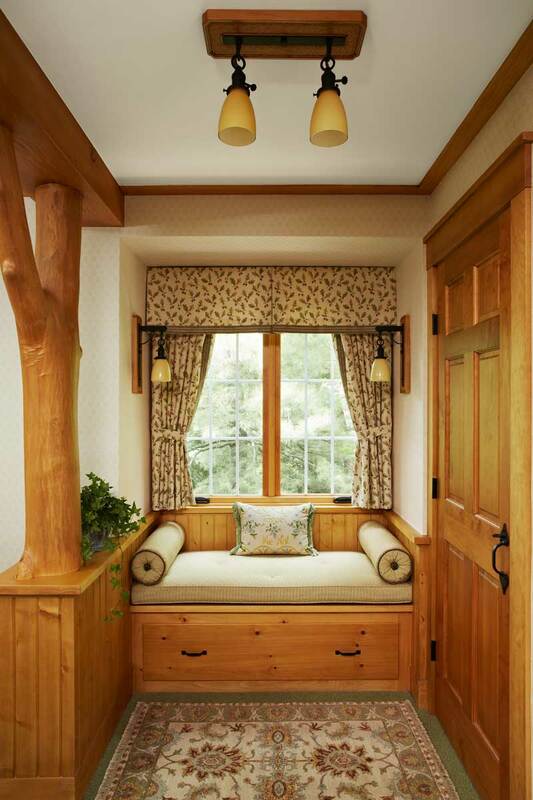 Doors in the dressing area open to two walk-in closets; the cozy window bench is a practical addition at one end. 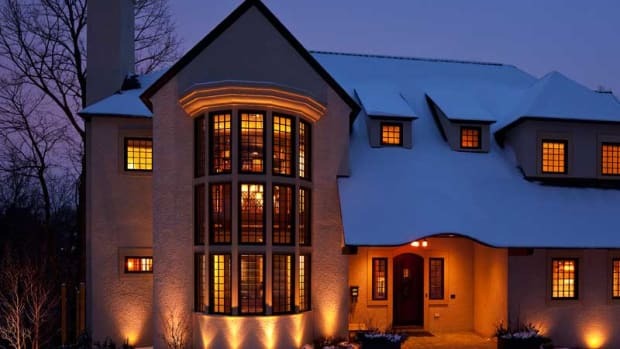 A passion for period design plus issues of mobility created this new home in St. Paul.